Have you ever wondered how to make your own patterns. Do you want to expand your sewing skills with the knowledge of how to change a pattern into unlimited styles? 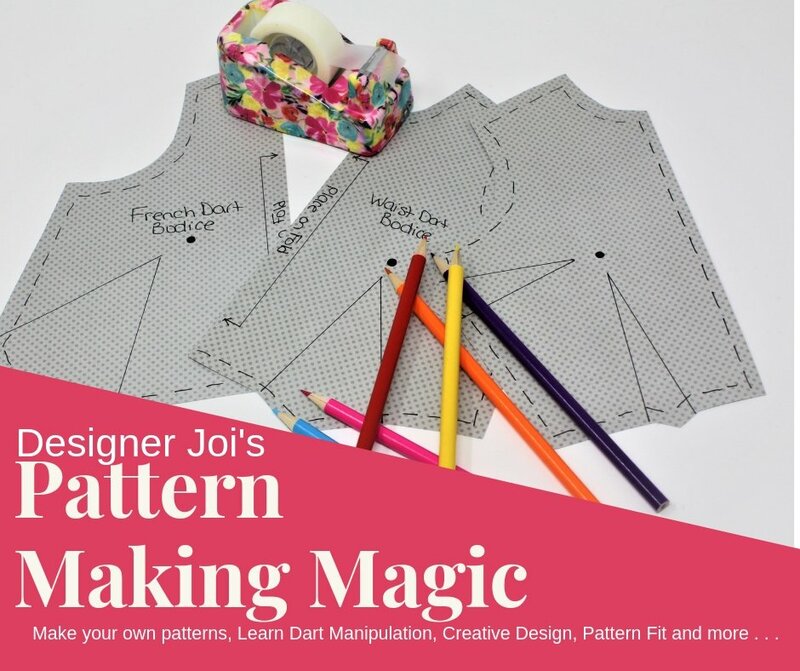 Join Pattern Expert Designer Joi in Pattern Making Magic. Learn how to make your own patterns. Learn dart rotation, dart manipulation, how to convert darts to other fitting elements, slash and spread techniques, creative design and the much sought after Back Fitting tricks and more . . . Joi will also provide you knowledge beyond the pattern. Learn how pattern styles interact with the body and how you can improve fit simply by how you make a pattern for your body. In this fun and interactive class students will make their own mini pattern collection to use in their own studios. Class will focus on the torso in half scale. BONUS: learn how to work in half scale. Save time, space and money with a smaller version of your patterns. Based on Designer Joi’s Private club Perfect Pattern and Fit Club. Do you have problems with tight fitting sleeves, does your collar set back off your neck, or do you wonder why you have draglines/wrinkles on your upper torso? Achieving the perfect fit of the upper torso may seem challenging to many sewists, but with a few tips, tricks and practice you can easily master fitting sleeves and the shoulders for beautiful looking garments. Join Designer Joi as she teaches how sleeves should hang on the body; not be too tight/too baggy, comfortable and set in correctly. Like any garment, more seams allow for more fitting so don’t be afraid of 2 or 3 piece sleeves and how to create a pattern for a sleeve of this style. Learn about the forward tilting shoulder and how the sleeve is the foundation for any garment that hangs on the torso. Learn how to experiment with muslin fitting and test your patterns for a perfect fit before you create your garment in fashion fabric. Interactive with student volunteer. What are your challenges in learning to fit pants? Join Designer Joi for this interactive class learning how to fit pants and apply her unique fit method to the pants pattern. Class will begin with a lesson on the pant pattern & pant components, how your leg shape affects fit, common fit problems in pants, and understanding areas of fit on the body/ leg. Learn what measurements are integral for fitting pants and how to adjust a pants pattern. What about ‘ease”? Enjoy a discussion on how much ease you need in pants as well as how to custom fit the crotch curve. Yes, saddle up because the saddle or crotch curve may be the reason your pants fit funny. Don’t miss some of the most important pants tips and tricks that are missed in most fitting and sewing classes. Friday, 4pm-8pm - Small bites and beverages will be provided. Saturday, 930am-430pm - Lunch and snacks will be provided.